The Skeleton, composed of bones, cartilages, joints and ligaments, accounts for about 20% of body mass. Bones make up the bulk of the skeleton. Cartilage occurs only in isolated areas, such as the nose, parts of the ribs and the joints. Ligaments connect bones and reinforce joints, allowing the required movements while restricting movements in other directions. Joints, the junctions between bones, provide for the mobility of the skeleton. Extends from the skull to the pelvis, where it transmits the weight of the trunk to the lower limbs. Running through its central cavity, is the delicate spinal cord. 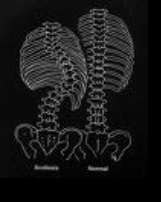 The vertebral column provides attachment points for the ribs and muscles of the back. It is divided up into: 7 cervical (neck) vertebrae, 12 thoracic (trunk) vertebrae, 5 lumber (low back) vertebrae, 1 sacrum and 1 coccyx. 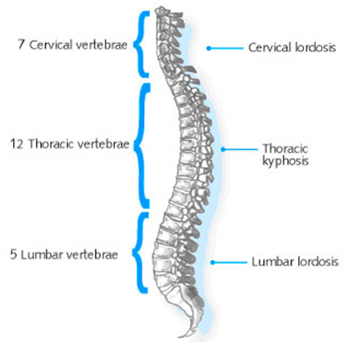 Variations in the numbers of vertebrae occur in about 5% of people. From the side - you can see the four curvatures that give it its 'S' shape. The cervical and lumber curatives are concave posteriorly. These curves should increase the resilience and flexibility of the spine and make it function like a spring rather than a rod. From the side - you can see the four curvatures that give it its 'S' shape. The cervical and lumber curatives are concave posteriorly. These curves should increase the resilience and flexibility of the spine and make it function like a spring rather than a rod. A Kyphosis - (hunchback) is, as it suggests an increase in the trunk (thoracic) curvature, common in older age due to osteoporosis. Lordosis - (swayback) increase in curve in lower back, common with pregnancy or with large tummies.